I Love You More Than Carrots: Maybe I Should Stop and Breathe? Yes, we've made it to Maryland. No, I haven't run away and deserted Hubs and Sheepie, even though the thought has crossed my mind. Yes, I've had at least one meltdown every day since we've been here. No, we're not living in our new house yet. Yes, we're staying with my in-laws in the interim. No, I do not know where I'm going and Yes, I need to allow for at least an extra fifteen minutes prior to finding any intended destination for getting-viciously-lost-in-the-country time. Are you seeing a theme here? I feel like we've been running around non-stop ever since our arrival late Friday night. And it's true. Because we have been. But we're here. We made it. And we're almost home. The house, which we fell in love with in the state in which it was when we purchased it, is already a different house. With fresh paint on the walls and brand new carpet throughout the upstairs- it looks amazing. I've gotten really good at picking out finishings and furnishings that are either a) too expensive b) discontinued or c) on backorder. Seriously. Line up eight different types of wood flooring and I'll fall in love with the one that's on backorder for six weeks. Sit me down in a warehouse full of sectionals and I'll fall in love with the sofa that was recently discontinued. Hey, at least I'm consistent. Today? We picked out our granite. I'm in love with it. It's from Brazil. And I'm waiting with baited breath for the husband to call and tell me that they don't have enough to fit the square footage in our kitchen. I might have a coronary. Sheepie has been a huge help and probably wonders why we keep leaving him in my in-law's basement for hours at a time while we head to the new house to unpack. Poor guy. We promised him we'd make it up to him though with his new half-acre of a yard. And maybe even a sheep or two. Just kidding about the sheep. Sort of. Although, there is a farm down the road with a few cows. We could just toss Sheepie over the fence and let him do his thing.. Hmm.. Hang in there with me, folks. I promise to be back and regularly posting as soon as we're moved in and internet-ready. Hopefully around Monday or Tuesday of next week. Sigh. In the meantime, I'll leave you with a picture of our darling Baby Boy M at 20 weeks and 6 days. On Friday the 26th, the day of our anatomy scan, he was measuring 11 inches long and weighing in at a whopping 15 ounces! Both Baby Boy M and I are measuring about a week ahead of schedule- but our August 7th due date still stands! Happy Tuesday, readers! Thanks, again, for hanging in there with me!! Sending you big hugs and i'm excited to see pics of the new digs! Totally precious! Aren't those scans amazing? Wow! 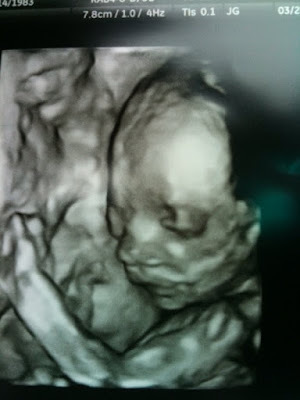 The 3-D ultra sounds are amazing! Good luck with all the house stuff - you'll be in and unpacking before you know it! Busy times! Glad you made it to your new city and are getting a lay of the land. this picture is AMAZING. it already shows what a gorgeous baby boy you're going to welcome into the world!! as for the moving - hang in there! sheepie, mommy, daddy, and baby will soon have a beautiful new home!! i feel like i always like the discontinued stuff, too.. uggghh. Maybe August 1st.. that's my birthday!! Welcome to Maryland! And that picture of your baby is incredible! Wow, you've got a lot going on right now! Hang in there. I can't wait to see pics of your new digs! what a precious pic! It sounds like you are in the midst of such a fun adventure! It will be over soon and you guys will be in your new home!